Let's not forget the Stamp of the Month is easier than ever to get at a great discount when you're already shopping for your favorite CTMH products. Spend at least $50 before shipping and tax and you'll qualify for the Stamp of the Month for only $5! Shop with me or your favorite CTMH consultant so you don't miss out on this deal. PLUS: The "Pair-A-Phrase" D-sized double stamp set is also yours FREE when you spend at least $75 before shipping and tax, so if you're a smart shopper you can really get a great deal this month. There are over 60 consultants participating in this month's Blog Hop so you're sure to get lots of ideas and inspiration with this versatile stamp set. If you're already hopping, you came here from Angel Sawyer's blog. Keep reading through my post to see where to hop to after me. For ease of designing a project, I took full advantage of the new Art Philosophy Cricut cartridge, the Stamp of the Month, and our Dimensional Elements Tags (which incidentally come in the Art Philosophy bundle) to make an accordion-folded mini album. What a quick, easy and fun project this was! 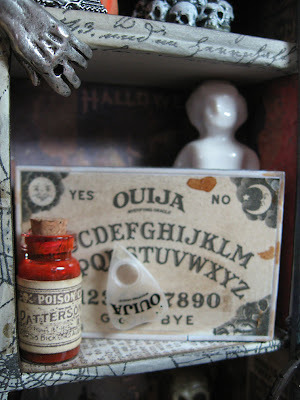 In the old days, you would have to trace the chipboard shape onto paper, cut out the paper, glue it to the chipboard and sand the edges to smooth out the imperfections of your cutting. Those days are gone! 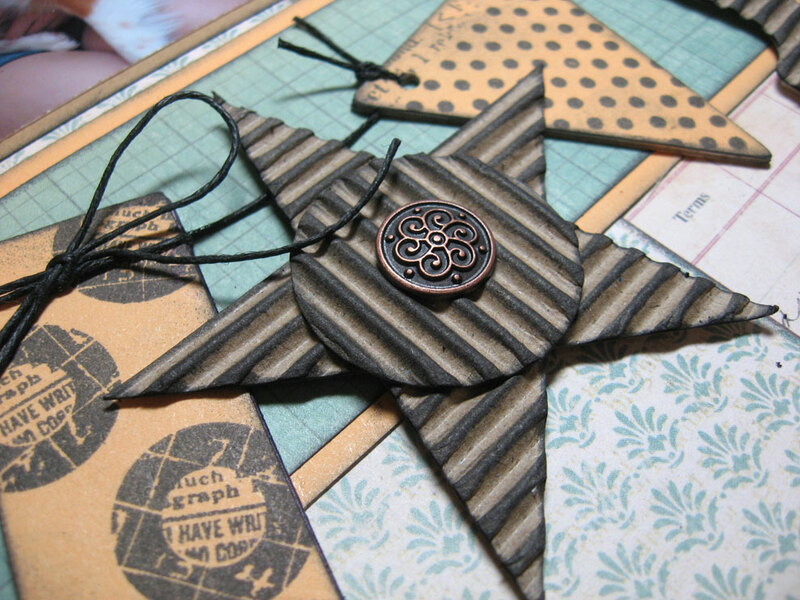 The Dimensional Elements chipboard package states the size settings so you can make quick work of the matching cuts on your Cricut machine. And bonus! The Stamp of the Month has two large tag images that also have matching cuts on the Cricut, and the sizes to make those cuts are listed on the clear carrier sheet in the stamp set. What could be easier? There are 12 tags in the package of the Dimensional Elements Tags. I used 8 of them and saved the four smaller ones above for another project. 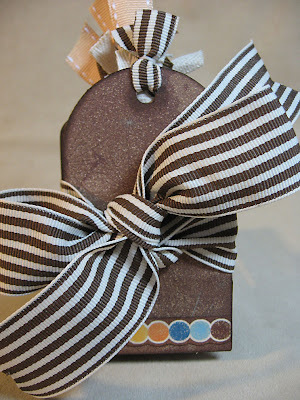 Using wide pieces of Scor-Tape, I adhered the tags in the order I liked to a piece of Dark Chocolate Striped Grosgrain ribbon measuring 20 inches long and later trimmed off the excess. 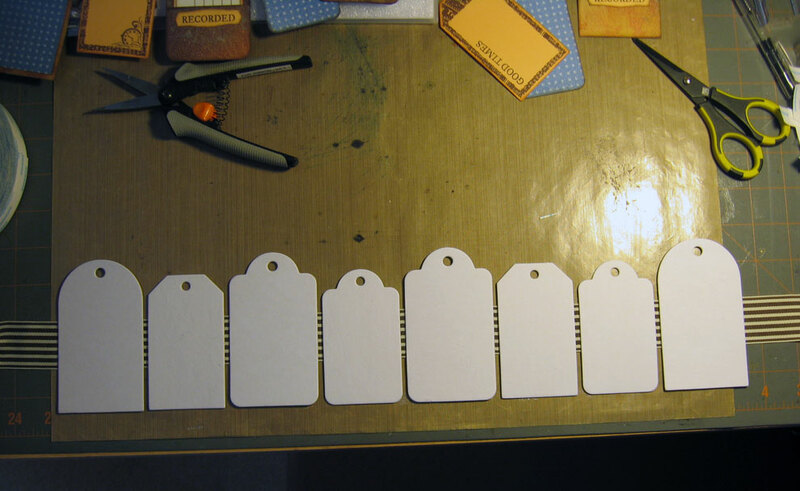 I made sure to leave a quarter-inch space between each chipboard tag as I adhered them to the ribbon to allow for folding. The wide grosgrain served nicely as a spine for each accordion fold. All the cuts you see on this mini are from the Art Philosophy cartridge. I didn't cut anything but the ribbon. 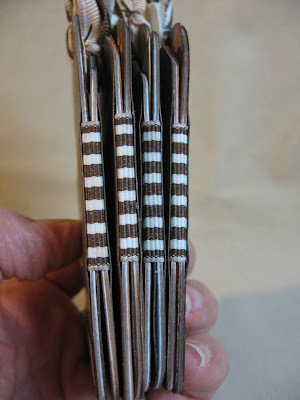 The journal cards fit into little pockets that were made by cutting out the base tag twice on the Cricut and using only 1 1/2 inches off the bottom of one of them, gluing it on three sides to the base. 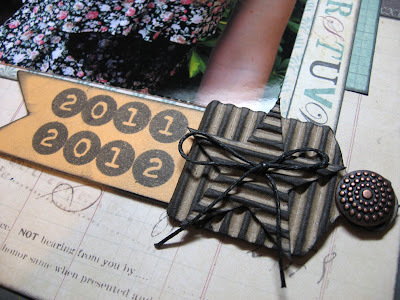 I finished off the closed album with another piece of the ribbon tied into a big bow. This piece measures 27 inches and then I cut a "V" into each end to make it pretty. 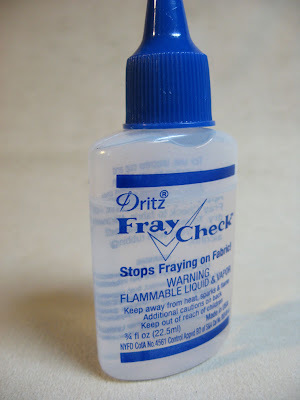 At this point, I have to mention Fray Check. This stuff is a girl's best friend. 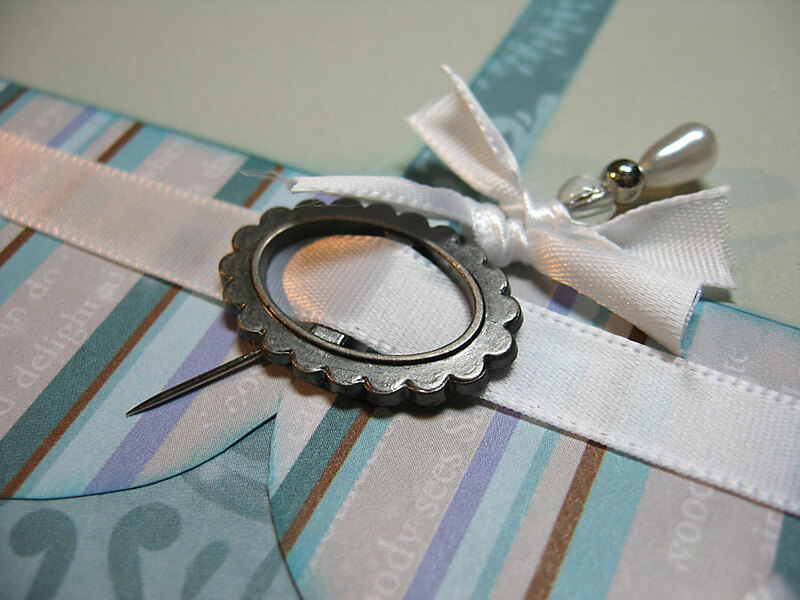 Since I used so many ribbons on the tops of my tags and I know there will likely be some handling of this mini especially of the outer ribbon, I squeezed a little of the Fray Check on the edges of each raw cut of ribbon, sealing them neatly and keeping them from fraying. This is especially important to use if you are cutting the wide ribbon in half like I did for the tag toppers. 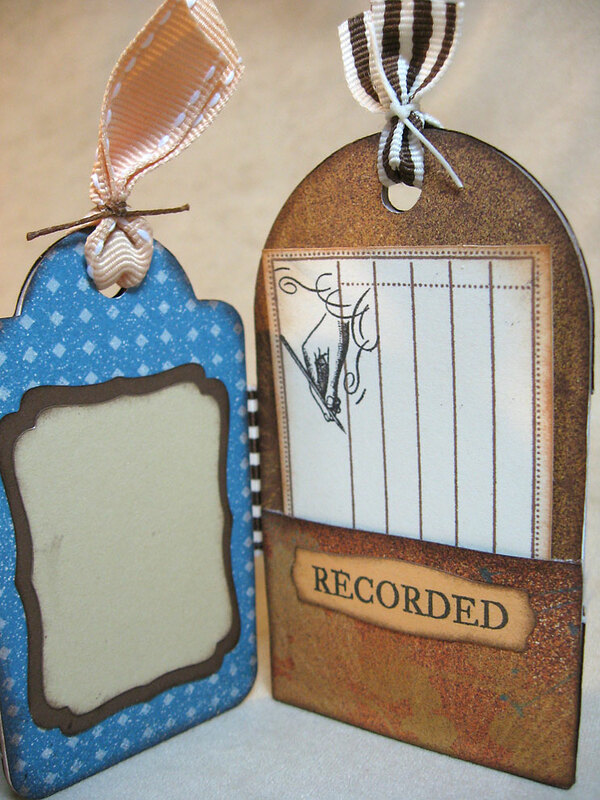 You can add Fray Check all along the raw cut areas of ribbon. It doesn't stiffen and dries clear. Great stuff! I do most of my designing standing up at my work table, so Suki took advantage of the space under my long craft table to take a snooze. I didn't even know she was there. She's never far, that's for sure. 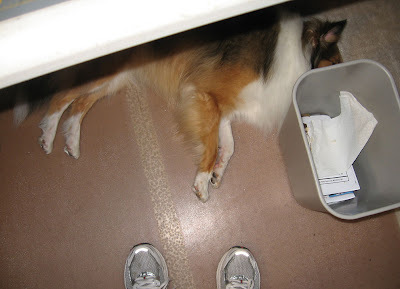 Thanks for stopping by today and reading all the way through my post. Now keep on hopping to see what Lori Brown's got up her sleeve. Enjoy your day! 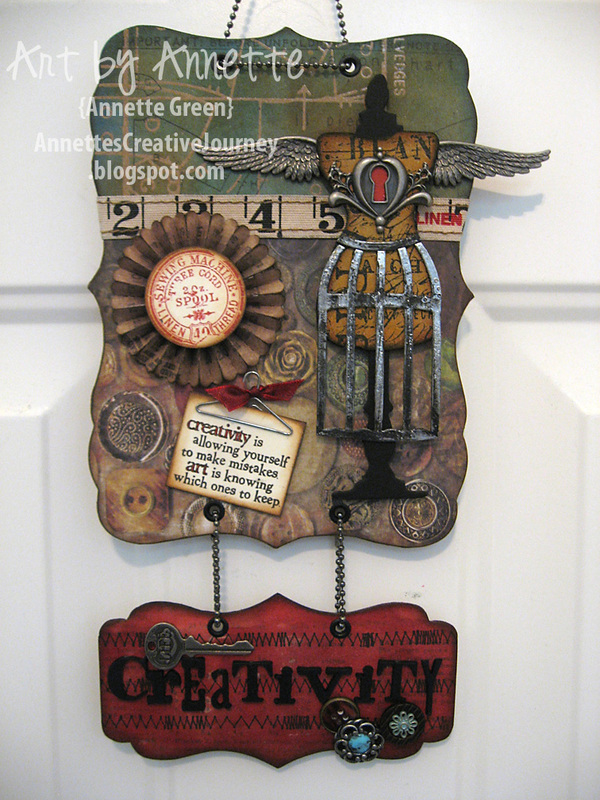 I was inspired by lots of different artists for this project, including Tim Holtz himself of course. You can search Google images by typing in Tim Holtz Configurations Box and WOW, there are tons of ideas and inspiration! I labeled these for my upcoming class, so they can start pre-cutting their papers. I took the photos in rather low-lighting to get the best effect. I hope you can make out the details. You can always click on each image to see it better. 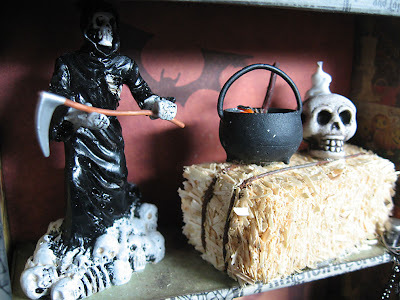 The hay bail, the witches cauldron came from Mary's Miniatures. The grim reaper came from Michael's in the seasonal section (Dept. 56) and the skull with the candle on top came from eBay. 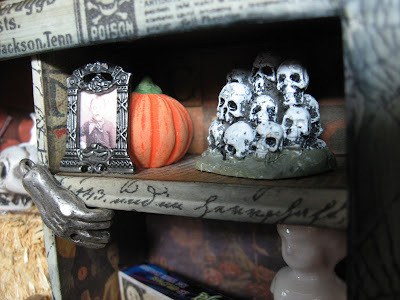 The tiny frame I found in the dollhouse section of Hobby Lobby and I copied a creepy image off the internet of a boy vampire to put inside it. Hard to see, I know. The piles of skulls came from Michael's. This Ouija board is SO cool because it has an actual drawer that pulls open which is intended to hold the little pointer piece, and the whole thing glows in the dark! I glued the pointer to the box after staining the box a bit. I got this at Amazon.com through Sunset Key Chains. Yes, it was a keychain and I just cut off the chain. 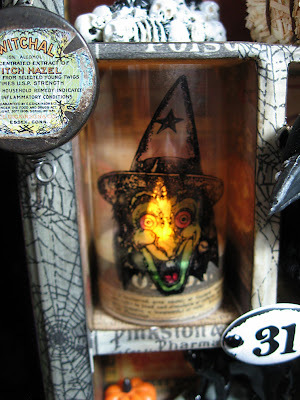 You also see one of Tim's fractured dolls and his tiny bottle with the cork. I stamped the label from one of Tim's stamp sets (Stamper's Anonymous "Curiosities") and filled the bottle with Liquid Glass and some Cranberry re-inker. 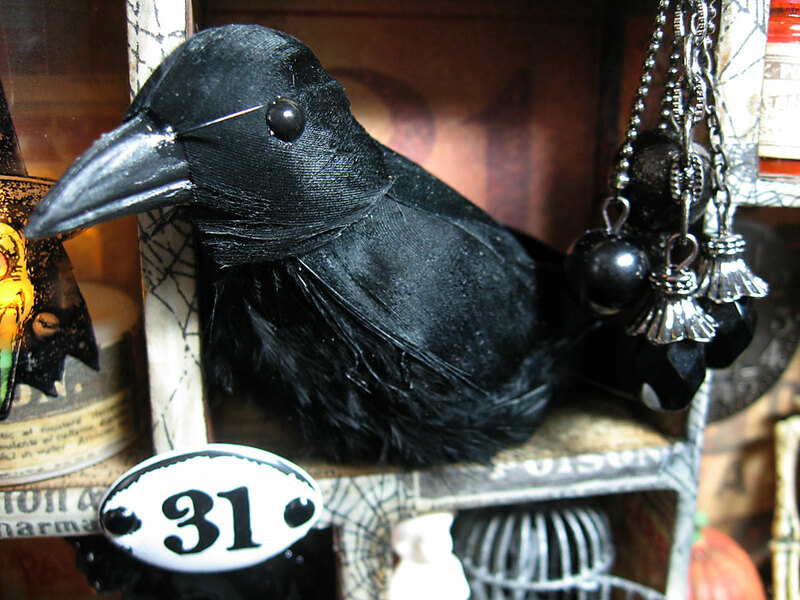 This big crow serves as a nice center point in the box. (Michael's) The 31 in Tim's Seasonal paper stash was cut strategically to fit behind the crow here. I love Tim's "Plaquettes" (metal 31 plate) because he has made sure some of the numbers in this pack have significance to holidays. (31, 25, 14, etc.) Those black dangly charms came from Michael's in the jewelry section too. The whole cluster is connected and hung from one of Tim's "Hitch Fasteners." This porcelain black cat sitting on his "Scaredy Cat Tales" book came from Amazon.com also. 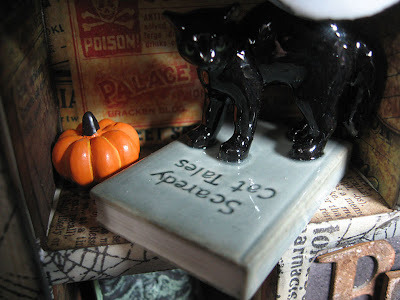 (Eyedeal Figurines) I have to tell you that the cost of all these great little tchotchkes (pronounced "chotch-keys") starts to add up quickly, so I would recommend hitting garage sales, flea markets and antique stores instead of shopping online and paying shipping for every item. Here's the other Fractured Doll next to a little birdcage I picked up at a local dollhouse miniatures store in Cocoa Village nearby. 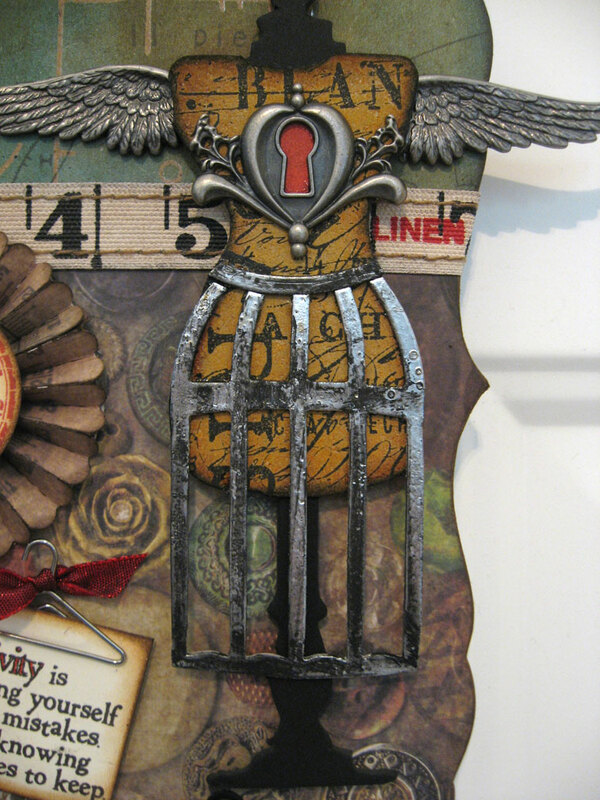 I stained it with some Slate Alcohol ink to tone down the newness of the pewter cage. 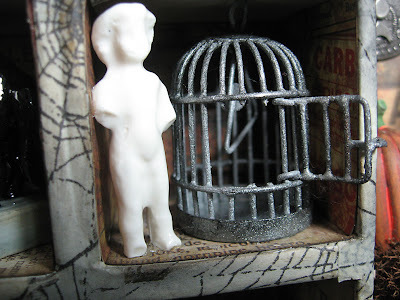 Shortly after finding this cage Tim introduced his new birdcage in his Idea-ology line. Okay, this is my favorite of all the cubbies and here's why. I love when pieces have some symbolism or significance and aren't just filled with random stuff for no reason. 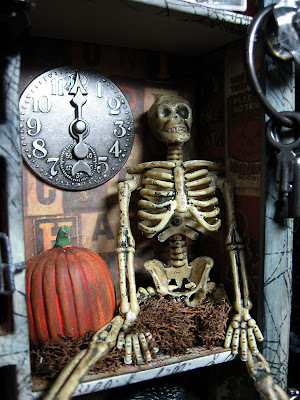 This skeleton came from Tim himself when I won a prize after posting a comment on his blog last year. I won the Raven and Scaredy Cat die and the Hobgoblin tissue tape, and when I opened the box there was this plastic skeleton and a few candy corns just for fun. See my post from last year. I've been saving him for just this purpose some day. More items from Michael's in the Dept. 56 seasonal line. I wish I could remember where I learned how to do this, but can't for the life of me. Maybe even Tim himself? If you know, maybe you can jog my memory. 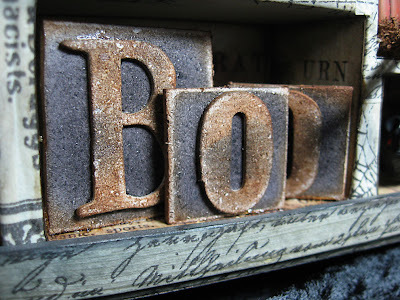 These are Tim's Grunge Blocks made to look like old alphabet blocks. They are completely flat, so it's deceiving. They really look like blocks from the front. Here's another look at the whole thing put together. I added a decorative Curio Knob on the right and hung a ring of old keys on the knob (Michael's, Industrial Chic jewelry line) and then finished off the bottom with Foundations (box feet). 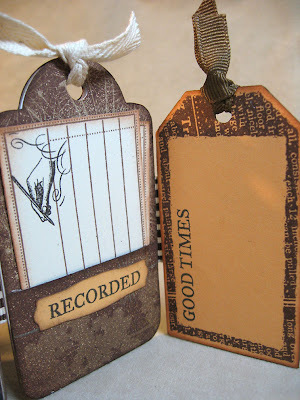 I didn't take the time to link every item I used, but just remember you can find all of Tim's products on Scrapbook.com and SimonsSaysStamp.com. Wow, this was a long post! Thanks for hanging in there. I had a blast making this Configurations Box and can't wait to work on my one for New York. Thanks for stopping by today. Enjoy your Monday! 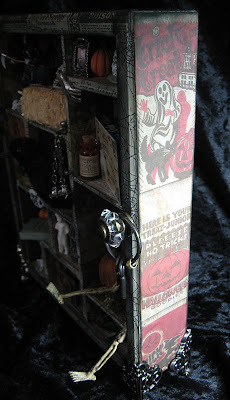 Tim Holtz, the master of all things deliciously grungy, of course. The same Tim Holtz that I will soon be meeting personally in 30 days to be exact, on the ScrapMap Tim Holtz Caribbean Cruise! 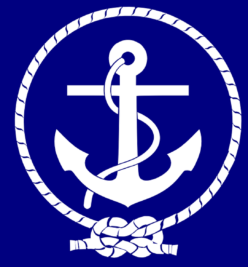 Royal Caribbean's 7-day Eastern Caribbean cruise. But I'm getting off track a bit. (Sorry, just terribly excited.) 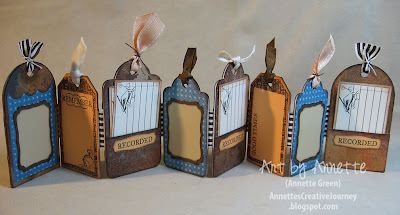 I have formed my own All Things Time Group, as I've mentioned before, inspired by Linda Ledbetter over at Studio L3. Linda hosts a fantastic blog where fans of Tim can share artwork and learn new techniques in the process. All those Grungy Monday challenges I've done are from Studio L3. I'm very excited to also be meeting Linda on our cruise! 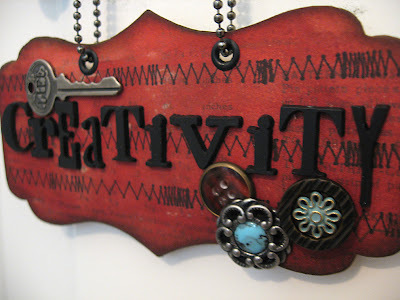 Even though my Creativity Artwork isn't a Grungy Monday challenge, it's all about Tim Holtz's products and techniques. My ATT group will be doing this project in October. I'll list all products used at the end of this post. The finished size from top to bottom of this little wall-hanging is 11 inches. What fun I had creating it, and I can't wait to hang it in my studio as a permanent decor piece. Adding the birdcage die to the dressform is not something new. I've seen it before by other talented artists, including Tim himself. I cut it from Grungeboard first, then I cut off the two outer bars of the cage and added the scoop at the waist from the spare parts. 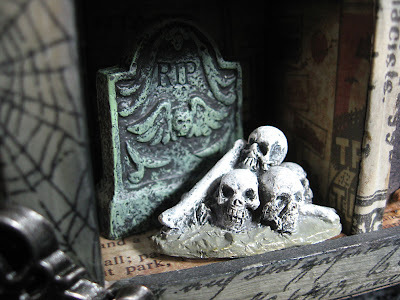 Before gluing it all down, I embossed the whole thing in silver, then rubbed some Pitch Black paint over it with my finger and wiped away any excess to achieve the look I wanted. This hanging piece is cut from spare chipboard. 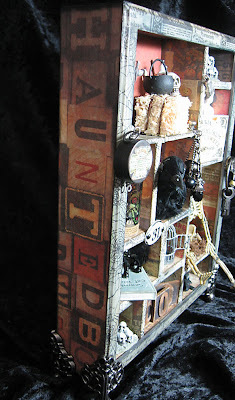 I used Tim's On The Edge "Brackets" die on the top and bottom of the chipboard to get this look. I should mention that the larger shape above this one came from Melody Ross's Bracket Chipboard Book. After covering this hanging piece with paper from Tim's Crowded Attic paper stash, I used Fired Brick distress stain to cover the whole thing with red. Love the ease of this! 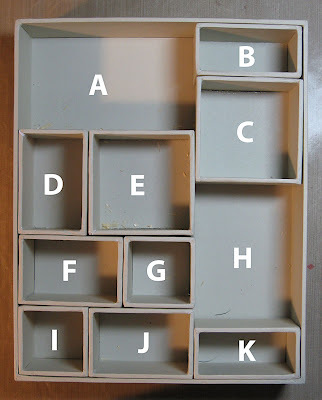 The letters are plastic with an adhesive backing. They're called Newsprint Alpha Parts "Ransom." • Newsprint Alpha Parts "Ransom"
• Various distress inks: Vintage Photo, Wild Honey, Faded Jeans, Fired Brick and Walnut Stain. Thanks for stopping by today. 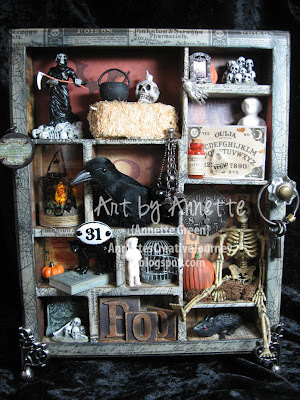 Enjoy your weekend, then come back and see me on Monday when I post my Halloween Configurations Box! 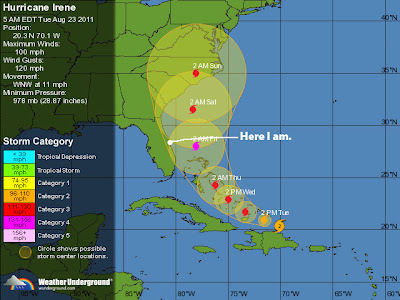 Happy to say that Irene looks like she's going to spare Florida. Just some pretty strong winds this afternoon through Friday. Now my concerns are for my blog friends from North Carolina up the coast toward New York. Stay safe, y'all. There's this gal Irene that no one really likes. I hate to say it, but she just causes trouble wherever she goes. I have my Cherish Club scrapbooking group this Friday night and she's been hinting that she's going to show up. After sending out my reminder to the club members yesterday for RSVPs, I'm not getting much response. They all are pretty sure she's going to be here. I may have to cancel. All because of Irene. Living in Florida, we are used to tracking and preparing for hurricanes. Fortunately, you never really see much panic. 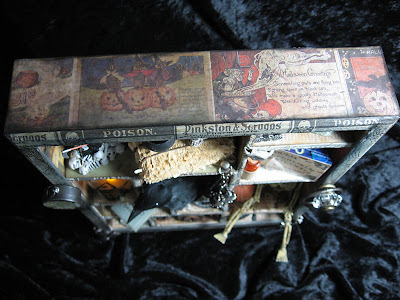 People calmly buy their water and canned goods, the hardware stores are busy with shoppers buying wood to block their windows, and if you're like me, you are starting to think about packing up your scrapbook albums in large waterproof containers. The only thing different about this time is my husband is in Denver on a business trip. But it's okay. My father-in-law's senior living facility is a certified category 4 hurricane shelter, so that's where we're headed if the need arises. So today I will join the shoppers and get my necessary supplies and have the news on all day in the background while I create in my studio. 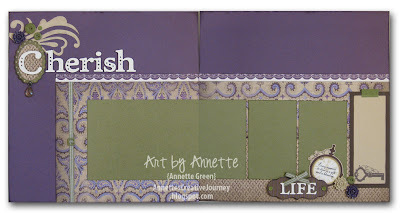 My Cherish Club meets monthly to create two 2-page scrapbook layouts and last week you saw all the of the first set of layouts we'll be doing for the next six months. 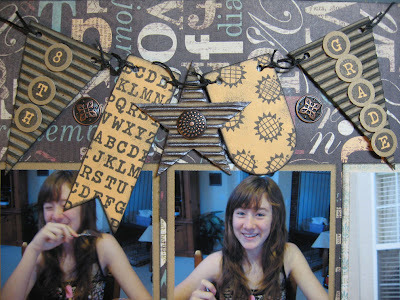 August's layouts feature the Typeset paper pack, and on my August 4th post, you saw the first one. 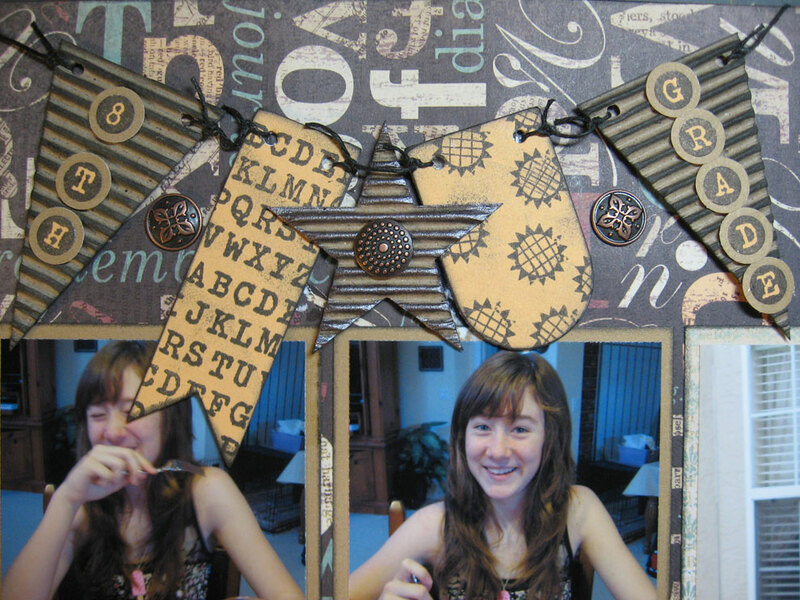 Today I wanted to share the 2nd layout utilizing a project challenge from the Heart 2 Heart blog where we are challenged to show off our back to school themed projects. 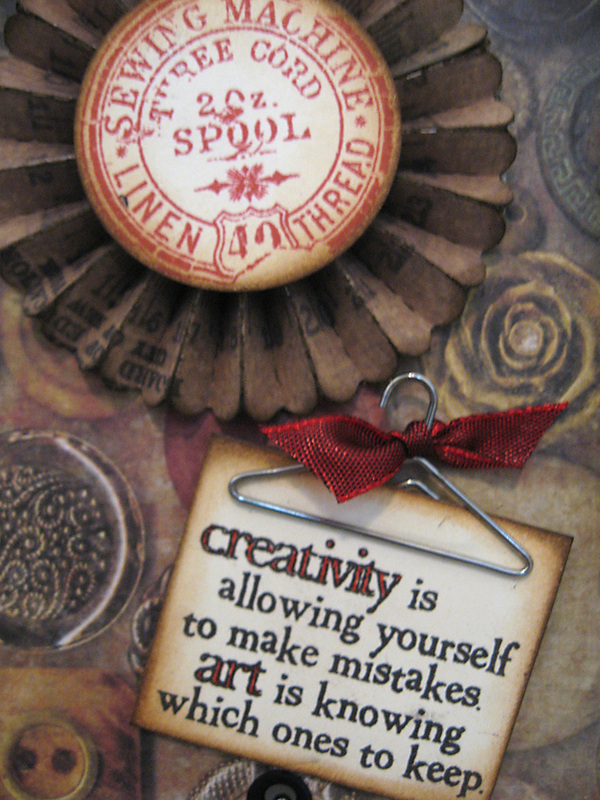 Not only that, Heart 2 Heart has a monthly layout sketch challenge. So I decided to kill two birds with one stone and tie them together. I have to say that my layout seems a bit busy with all that's going on in the pattern paper in the background, but that's okay. We're not out for perfection here. And my middle schooler loved the pages, so that's really what counts, right? Here you can get a good look at those Milepost Shapes which I inked with Black and layered. Of course I had to use the Cricut Art Philosophy cartridge for my title. I love the "Vintage Type" stamp set, complete with a full alphabet, pennants, and background images. It's one of my all-time favorites this season. 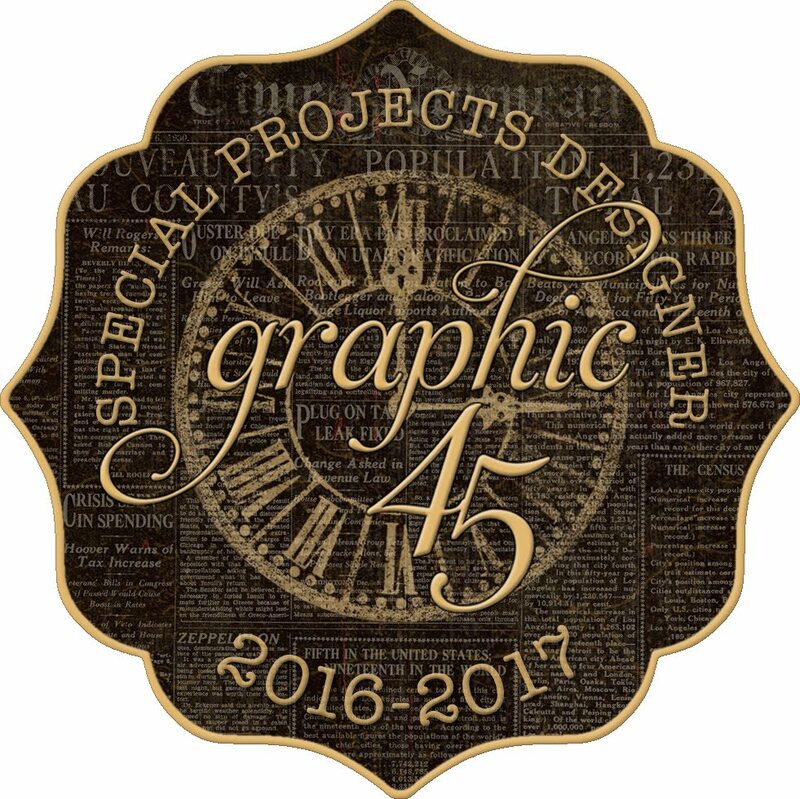 I can't get enough of the new Antique Copper designer brads. They fit all themes so well! Jamie is in her third week of 8th grade already this year and is enjoying it so far. My little social butterfly has mastered the art of being social and getting good grades at the same time. I'm very proud of her. Thanks for stopping by today. Hope you enjoy your Monday! New Products Feature - "'Sonoma'"
Happy Friday bloggers! 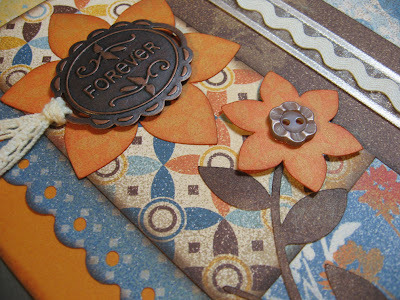 Sonoma is the final paper pack I'm showcasing this week. 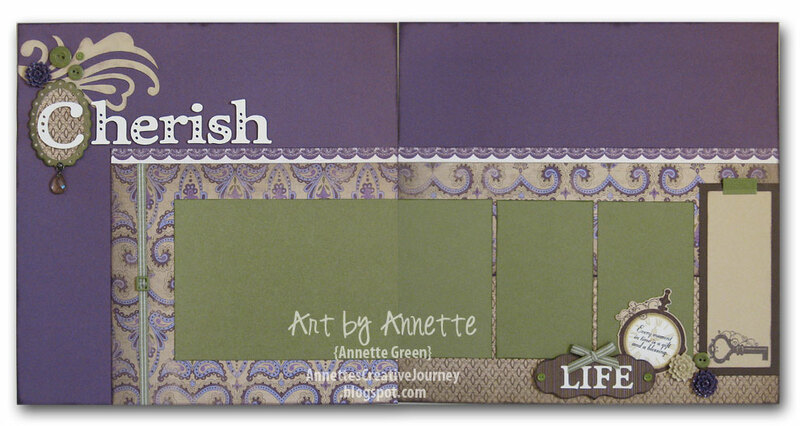 Be sure to check out all the beautiful papers in this pack at the link. So lovely! I'm really excited about the embellishments that coordinate with this paper line and you'll see why. By now you may have guessed that I have just about trashed my Art Philosophy Cricut booklet with all the usage it's gotten this past week. And YES, I have gone through two cutting blades in the past two weeks alone. But what fun I'm having! Here's a close-up view of the cluster in the upper left corner. So much going on here to talk about. The flourish cut is from the Art Philosophy cartridge, page 59 in the booklet, cut at 2 1/2 inches out of Bamboo card stock. The lettering is also from the cartridge cut at 1 1/2 inches. The scalloped oval is a combination of the new Mixed Shapes chipboard plus cuts from the cartridge (inner oval is 2 inches and outer one is the same, page 52 in the booklet). 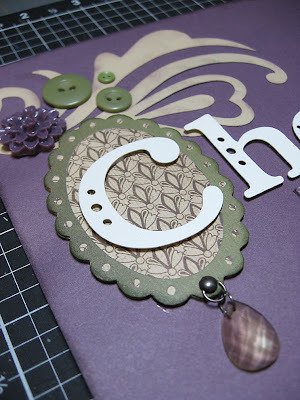 This cluster on the lower right page contains some accents from the new Olive Mini Medley accents. 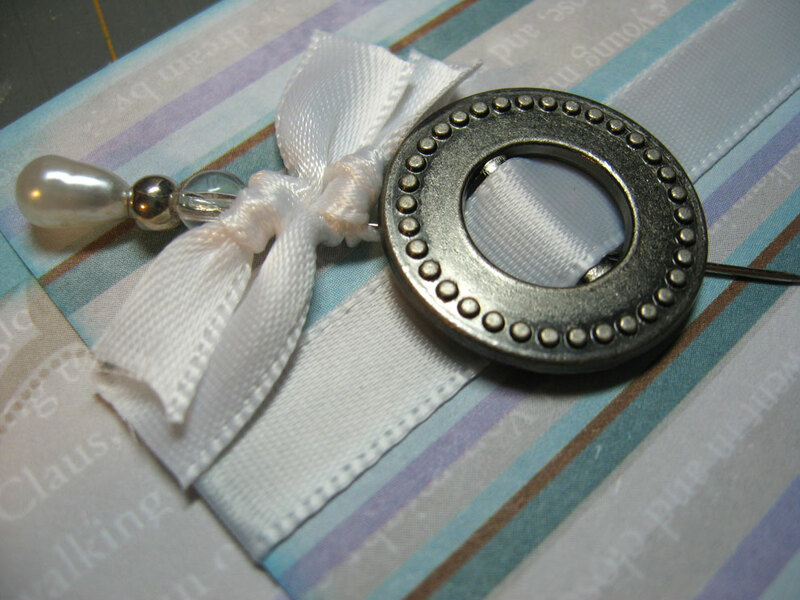 Small button brads, buttons, ribbon, ribbon slides, frames and tabs. The LIFE accent consists of another chipboard piece from the Mixed Shapes mentioned above and the striped paper was a Cricut cut that fits exactly over the chipboard (1 1/2 inches). I am loving this! So easy! No cutting around chipboard and sanding and all that. The word LIFE was cut from the cartridge at 1 inch. 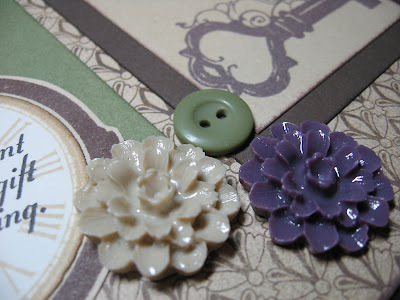 Here's another look at the Heirloom Assortment resin flowers. These are adhesive backed too. So shiny and pretty, they almost look wet. 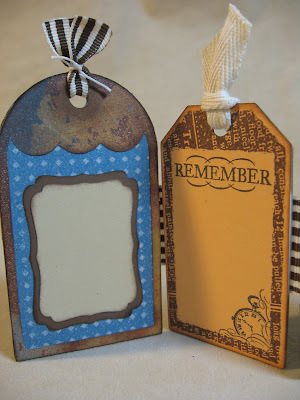 I should mention that the stamp set I used on this page is called "Key Moments." It's right up my alley with its vintage yet feminine feel. Thanks again for stopping in today. I think I'll rest a bit now and kick it back in on Monday. Enjoy your weekend. New Products Feature - "'Wonderland'"
Wow, I don't know where the day has gone. It's already the afternoon! 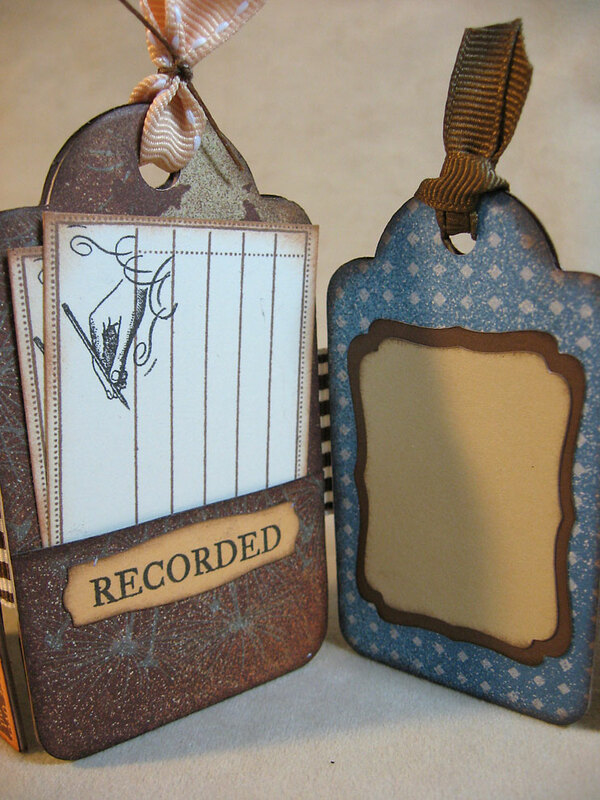 Today's new product feature is Close To My Heart's Wonderland paper pack. Be sure to check out all the beautiful papers in this pack at that link because my layout only showcases half of it. 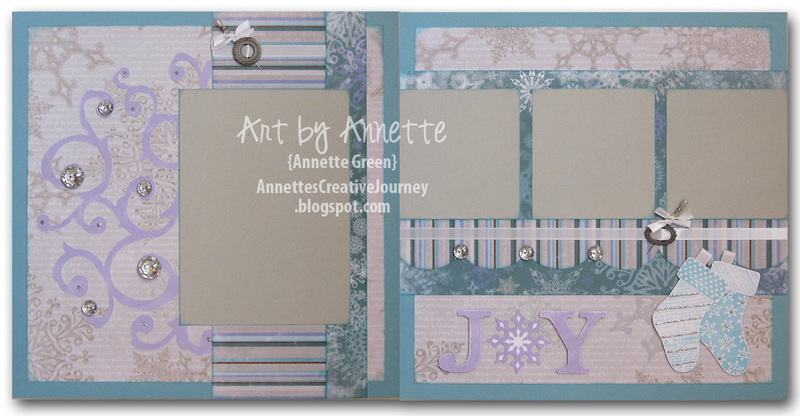 Although it's not snowy here in Florida, I love this color scheme and the snowflake prints so much, I'll be using these pages for my Christmas photos this year, snow or no snow. 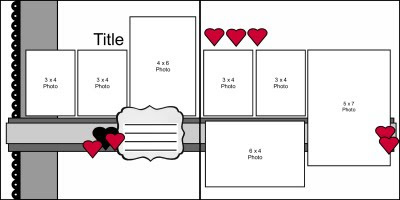 I should mention that Amethyst (light purple) card stock is not included in the Wonderland paper pack, but I felt like it really belonged so I added one sheet to my club pages. The large swirly cut on the left page is from the new Art Philosophy Cricut cartridge on page 31 in the booklet, cut at 10 1/2 inches. I used the inside of the cut only. 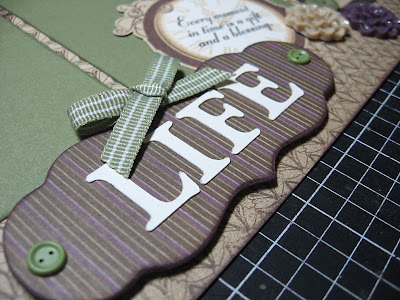 I have a thing for words, and I LOVE to work some words into a background, whether through stamping or in the paper. The text contains a mélange of phrases having to do with snow, Santa, children and such. And check out the bling! Those big sparklies are actually bling buttons with two holes in each. I opted for not threading anything through them on this layout. (I think I was getting sleepy.) These are part of our new Bling Assortment embellishments. You'll see in the next few photos that this embellishment pack also contains pretty stick pins too. I was working on this layout late into the evening and discovered that I didn't have any White Daisy grosgrain ribbon, so instead I had to use some satin I had in my stash. (Still pretty though.) The pewter ribbon slide is from the new Foundry Metal Accessories Ribbon Slides collection. 12 slides, 2 each of 6 designs. Another one is pictured below. 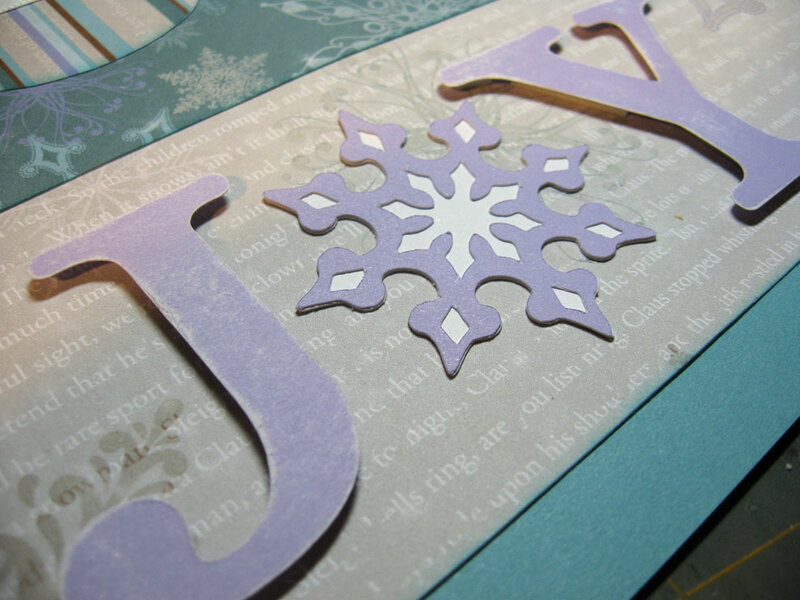 The J and the Y on the right page is also from the Art Philosophy cartridge, as is the snowflake for the O, all cut at 2 inches. I lightly sanded the card stock for a snowy look. 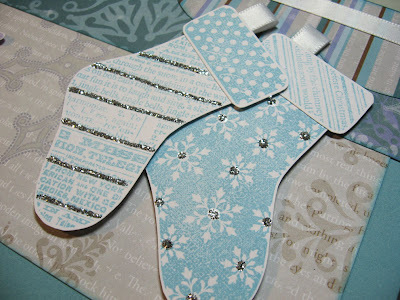 The cute stockings are a sneak peak into the October Stamp of the Month called "Holiday Magic" which I stamped with Crystal Blue ink and embellished with Silver Glitz Glitter Gel. 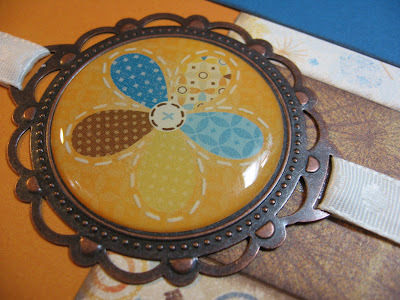 the beautiful Sonoma paper pack and more Cricut cuts! New Products Feature - "Dreamin'"
Today's new product feature is Close To My Heart's Dreamin' paper pack. So beautiful! 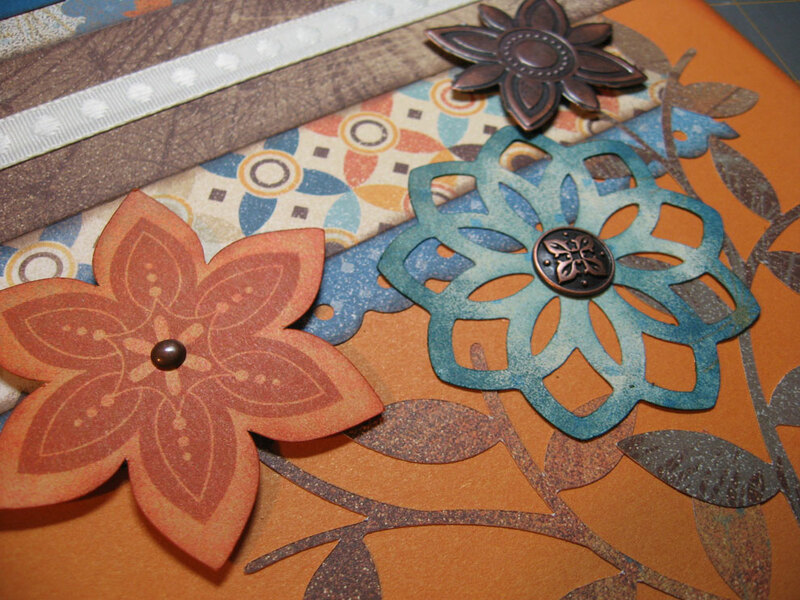 You've got to check out the link to see all the pretty paper options in this pack. With the new Art Philosophy Cricut cartridge, I was able to make quick work of creating flowers and leaves which I cut from the B&T (background & texture) paper in the pack. The two flowers you see here are from page 39 in the Art Philosophy booklet cut at 1 1/4 and 2 1/4 inches. 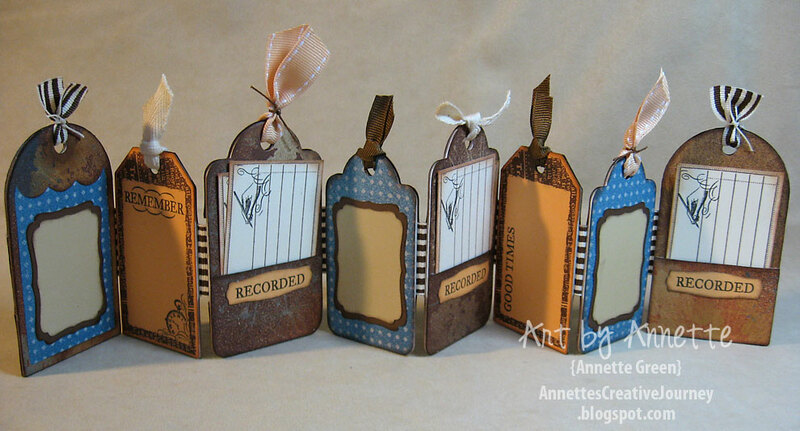 The pretty Antique Copper "Forever" embellishment is from the new Harvest Charms accents which I have used throughout the layout, and the ribbons all come from the Colonial White Collection. 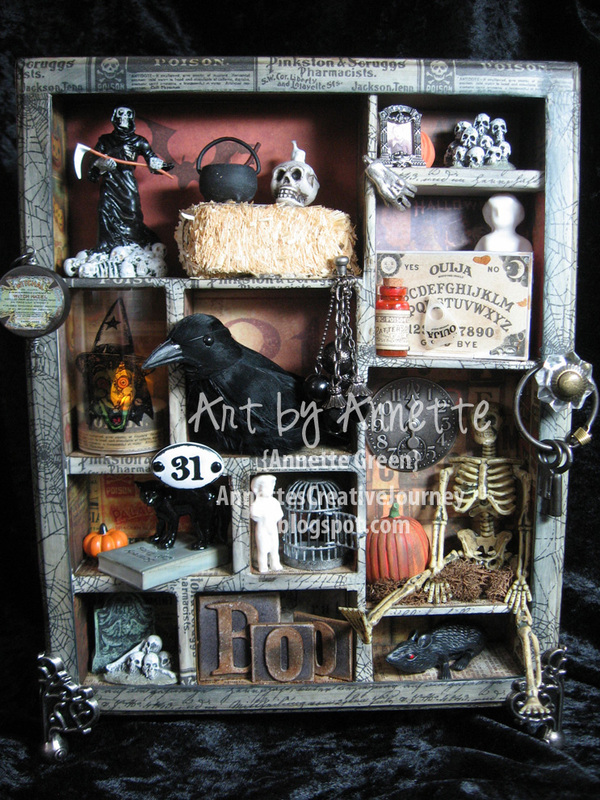 If you clicked on the link above for the Harvest Charms, you saw all the great pieces in this embellishment pack. This bird is one of my favorites! 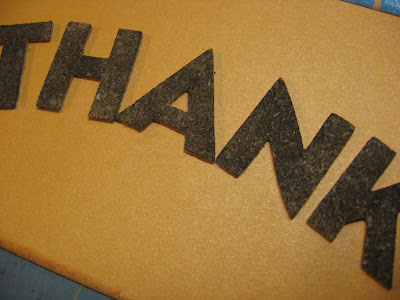 Another new product is the Color Ready Cork Alphabet, self-sticking letters. 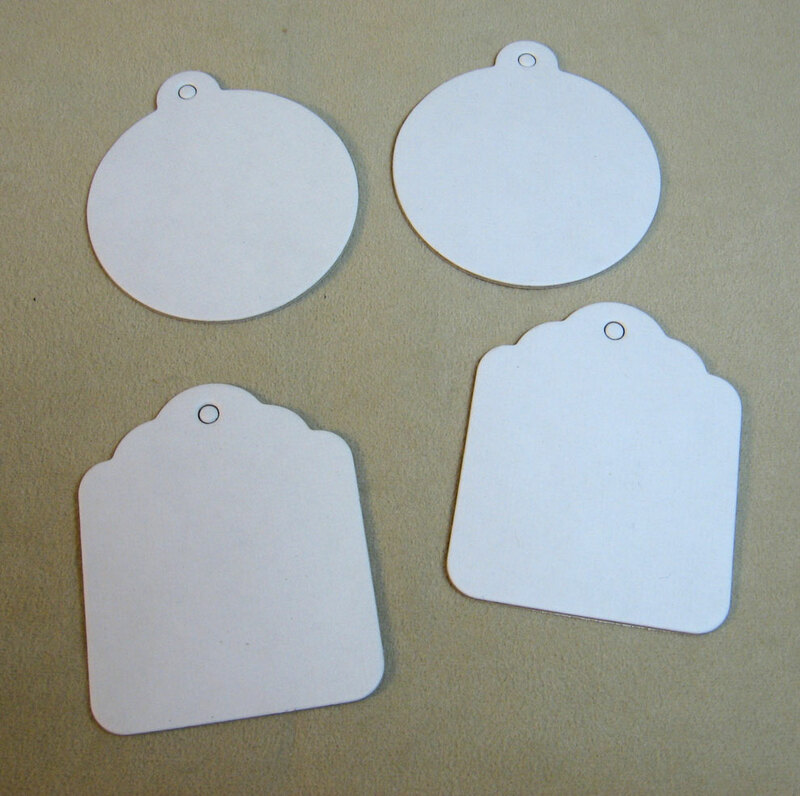 As you can see in the linked image, these contain two sheets and are a plain cork color. 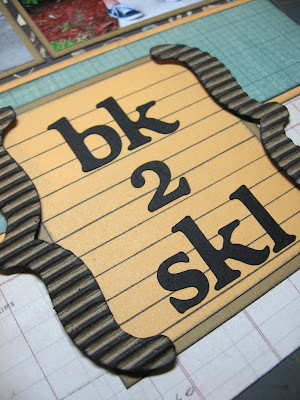 I opted to rub Chocolate ink over the tops of my title for a cohesive look in this layout. 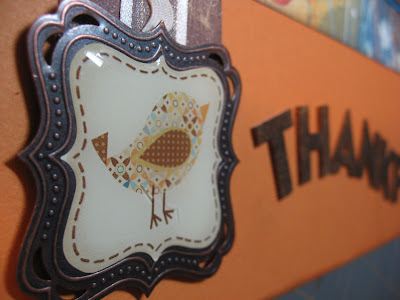 Here's another one of the Harvest Charms. I love how they are ready for ribbon with those ribbon-slide sides. Did I mention these are peel and stick? How easy is that? This cluster contains another of the same flower cuts from before (2 inches, then stamped with our coordinating stamp set from the Art Philosophy bundle), the lacy flower is from page 51 in the booklet cut at 2 1/4 inches. All the leaves on the layout are cut from page 35 in the booklet at 2 1/2 inches each. I cut a total of four to accomplish the look I wanted. 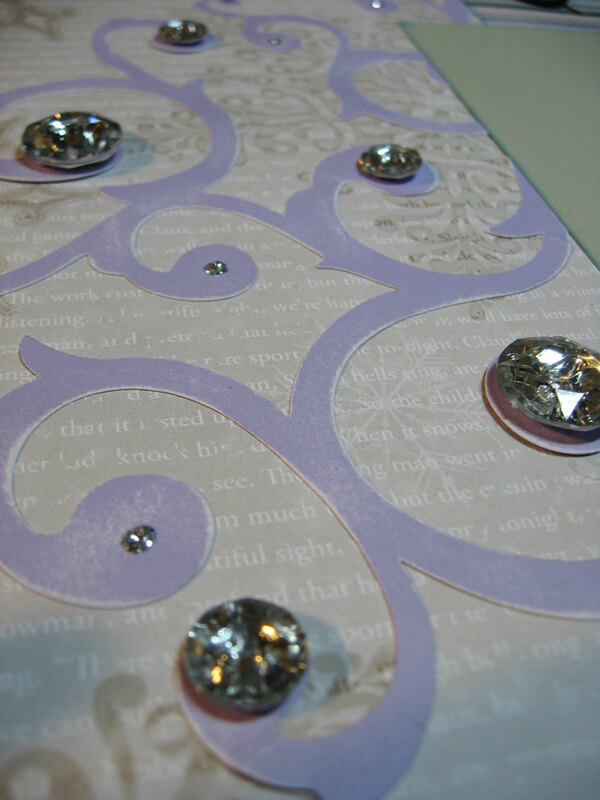 I love how the B&T paper looks like it has a shimmer to it. Close To My Heart's papers are absolutely top quality and every so beautiful. Thanks for stopping by today. Stay tuned for tomorrow's product feature: "Wonderland." 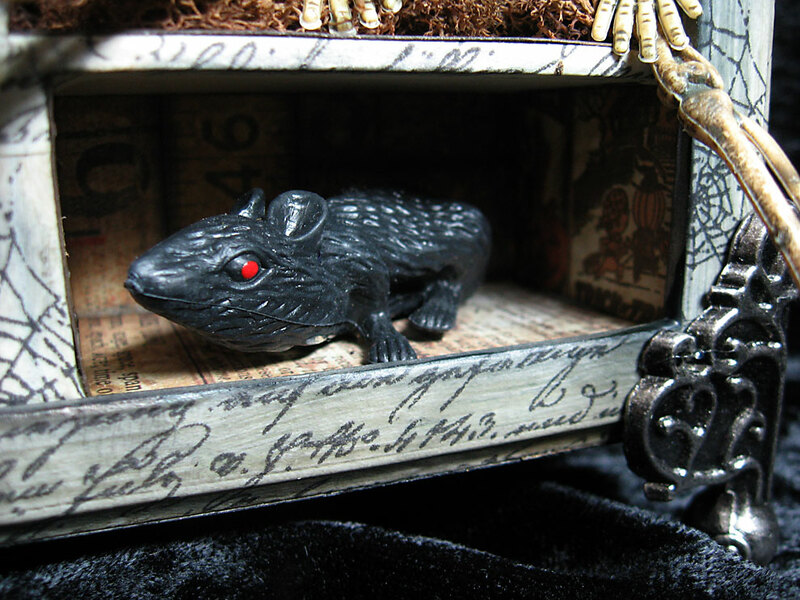 New Products Feature - "Roxie"
New Products Feature - "Mischief"